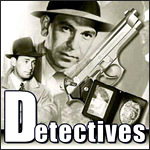 Ross Dolan was a veteran private eye who solved crimes on the air from January 21, 1946 through October 18, 1947. Starring William Gargan. 4. The Green Hornet: Fights Crime!